The tragic internment of some 120,000 Japanese-Americans during World War II forms a most unusual but compelling backdrop to the musical “Allegiance,” which has come to Broadway after a run at San Diego’s Old Globe Theatre in 2012. The story was inspired – in general terms -- by actor George Takei’s personal story of his family being kept “behind barbed wire in two different camps” for four years when he was a child. 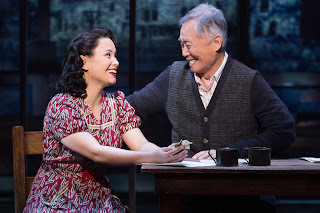 In this fictional story, 78-year-old Takei appears first as Sammy Kimura, an embittered old military man in the brief present day scenes which frame the main action, and then, quite endearingly, plays Sammy’s ever-wise grandfather in the 1940s flashback scenes. The book, written by Marc Acito, Jay Kuo, and Lorenzo Thione, relates how, after the bombing of Pearl Harbor, the Kimura family: Sammy (Telly Leung), his older sister Kei (Lea Salonga) who raised him after the death of their mother, their father (Christopher Nomura), and grandfather were brought to an internment camp in Heart Mountain, Wyoming, forced to sell (for a pittance) the artichoke farm in California where they had lived comfortably for two decades. There, Sammy falls in love with a sympathetic nurse Hannah (Katie Rose Clarke) who works in the camp’s pharmacy, and Kei with fellow resident Frankie Suzuki (the likable Michael K. Lee) whose parents have been arrested and sent elsewhere. The central conflict arises from the different outlooks of Sammy and Frankie. The former wants to prove his fierce loyalty to the United States by enlisting in an army which doesn’t want any Japanese, while Frankie believes that as long as his family is incarcerated, he is not willing to put his life on the line. When Mike Masaoka (Greg Watanabe), head of the Japanese-American Citizens League in Washington, finally persuades the government to allow Japanese to enlist, albeit only to fight in the most dangerous situations, Sammy gets his chance and becomes a war hero. .
Donyale Werle’s versatile set design as lighted by Howell Binkley and Alejo Vietti’s handsome period costumes make for an attractive production. The largely Asian cast is strong. It’s a treat to see Lea Salonga back on Broadway in a big role. She’s not the youthful waif of “Miss Saigon” but now an attractively mature woman. The years have scarcely affected her voice which is still a remarkably pure and powerful instrument. (She even gets to kick up her heels at one point.) Telly Leung sings and acts well as the increasingly militant Sammy, though his often strident character is very much in the anti-hero mode, and often his actions are downright unlikable (as when he declares that anyone who resists the draft must be harshly punished), though, of course, redemption comes in the end. “Allegiance” gets high marks for shedding light on a dark chapter in America’s history, and one that has undeniable resonance in light of the current debate about immigration, and the show has been constructed with not a little intelligence, but as a musical per se, it can’t be said to hold a candle to the pop operas composer Jay Kuo seeks to emulate. 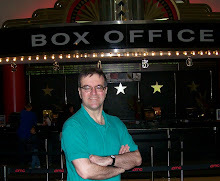 The songs – though not unpleasant -- mostly have a blandly generic quality, except for the occasional pastiche 1940s number like the Andrews Sisters-inspired “442 Victory Swing” entertainingly delivered by Dan Horn, Kevin Munhall, and Scott Wise. Salonga has a soaring ballad in “Higher” that allows her to demonstrate her undiminished power, even if the song itself is rather lackluster. The first act finale “Our Time Now” is appropriately stirring. And the song about “Gaman,” the “endurance-with-dignity” with which the characters resolve to face their hardship, has a sweet lilt. Occasionally, the Broadway pop elements are interspersed with some alluring Japanese flavoring, which varies the musical palate. But much of the rest seems pedestrian, at least on first hearing. Still, shortcomings aside, the story holds your interest, makes you think, and ultimately, it must be said, proves quite touching.